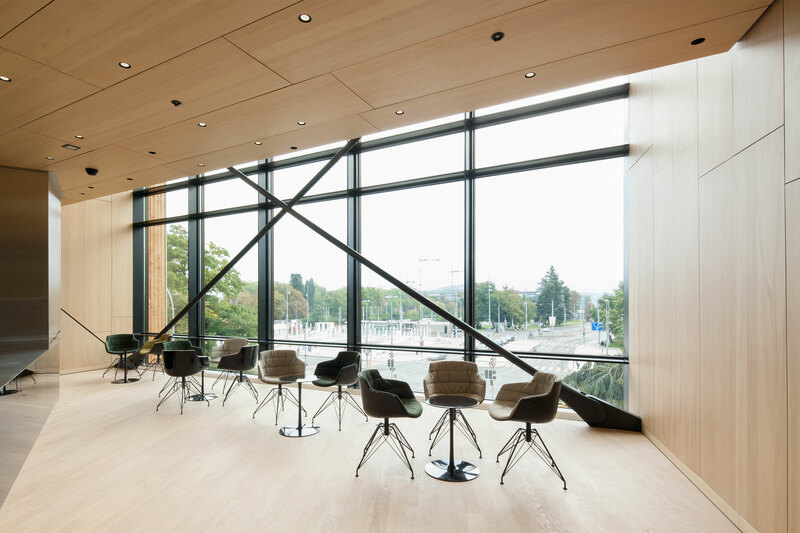 Wood is the dominant material in the new conference hall building for the Geneva-based World Intellectual Property Organization (WIPO). With wooden cantilevers up to 35 meters long, WIPO’s new hall opens up a new dimension in modern timber construction designed to meet the client’s goals of an environmentally friendly and structurally appropriate building. 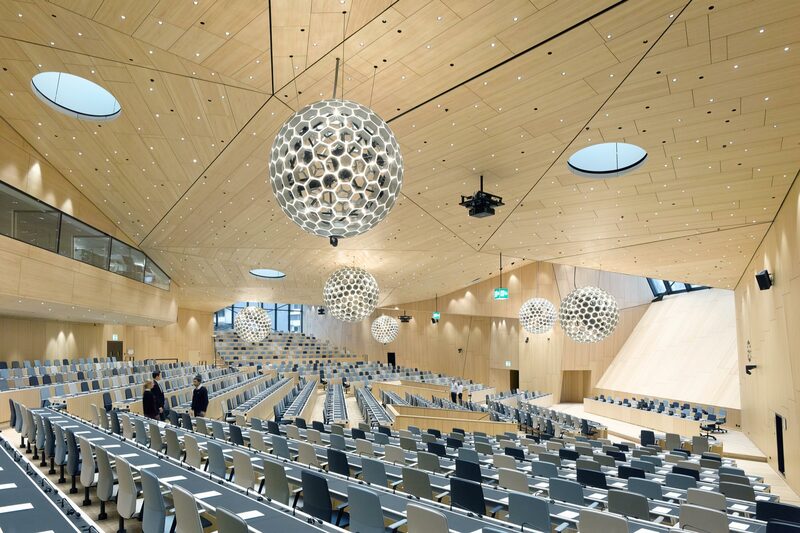 In close collaboration with architects, structural engineering planners and environmental engineers, a sculptural design concept has been developed into a conference hall, a pioneer project in constructive timber construction. 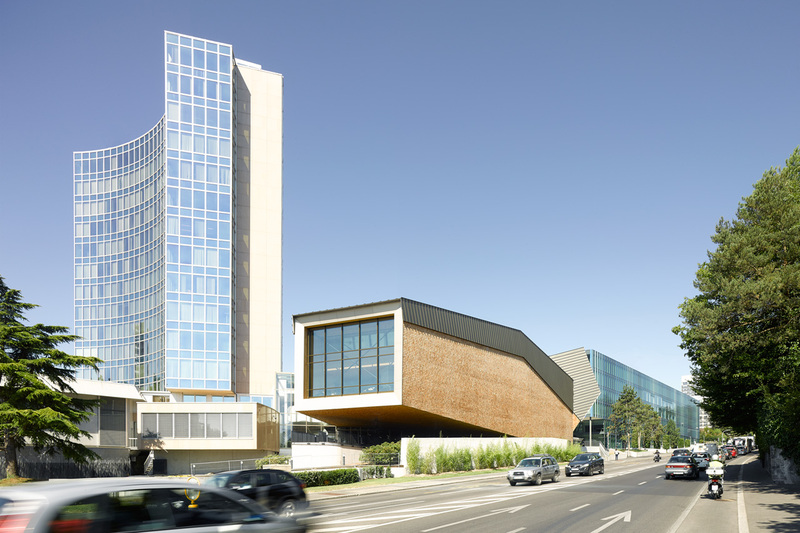 The new conference hall that accommodates about 900 delegates closes the gap between the WIPO’s landmark tower and a new administrative building also designed by Behnisch Architekten (KlimaEngineering Transsolar) and completed in 2011. In the early design stages it was decided that wood was the material with the most suitable characteristics for meeting WIPO’s design criteria. Timber has been utilized for its flexibility as a structural material, ranging from large span beams to small scale cladding elements including the larch shingles of the facade. The desire to use renewable raw materials – virtually all of the wood used in the construction is sourced from Switzerland – as well as the structural-physical and fire-protection characteristics played an important role in the decision made by the architects, structural engineering planners and environmental engineers to design a building made primarily of softwood. The low ratio of embodied energy required also played an important role, as did the thermal characteristics and haptic qualities of the material. Its small proportion of thermal mass and subsequently its short response period is advantageous for the intensive utilization of the building during conferences and the phases in between. The synergies between the wooden supporting structure and the technical construction are shown for example in the utilisation of existing cavities resulting from the structure, which are used to direct the air. In connection with radiative cooling surfaces, the efficient displacement ventilation provides a high level of comfort for the user with minimum use of energy. The renewable cooling energy will be drawn from Lake Geneva. The body of the hall itself is also finished in local timber on the interior and hence forms a room with a very pleasant ambience, which is enhanced further by the specific utilisation of daylight. 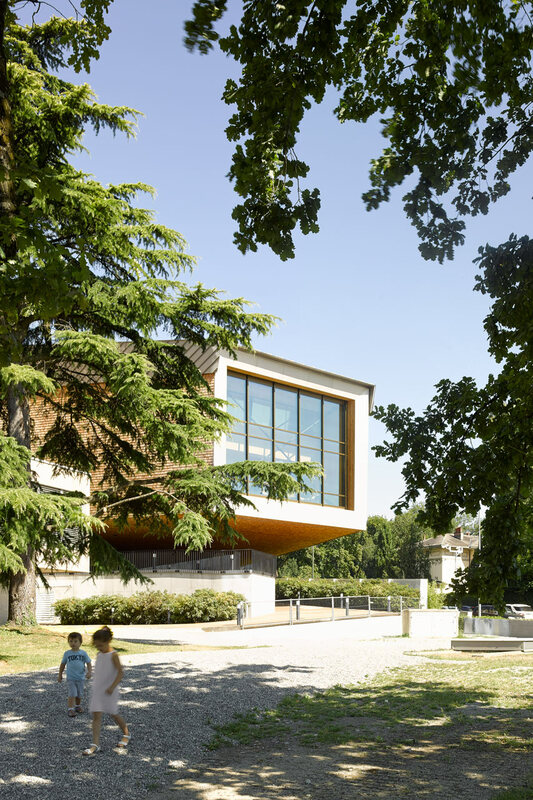 The openings of what is otherwise a rather introverted building clad in wood shingle have been emphasized, the largest of which provides a view of the French alps and Mont Blanc in the distance.